(01/29/18)—The Annual Report is intended to provide an overview of Utah’s air quality, as well as the Division of Air Quality’s organization, activities, and progress throughout 2018. Utah continues to make significant progress towards understanding and addressing the causes of seasonal air pollution. Increased public awareness and legislative funding for research have provided important support for the DAQ in its ongoing efforts to reduce pollution, improve air quality, and protect public health. (8/23/2018)–Residents may be eligible to receive up to a $3,800 incentive to convert their existing fire place or wood stove into a natural gas or propane device. Visit the Wood Stove Conversion Assistance Program for more details. Am I in a Non-Attainment Area? (06/26/2018)—An address and coordinate search tool that shows air quality non-attainment and maintenance areas in Utah. (02/08/18)—The Utah Division of Air Quality has implemented an online, web-based method of emissions inventory submittals. 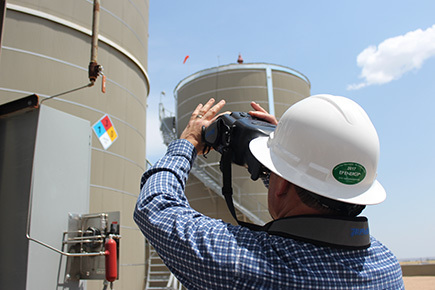 The registration process will help UDAQ identify oil and gas facilities on state lands, thereby increasing the resolution of oil and gas emissions inventories and allowing for more comprehensive compliance assessments. The State of Utah will become a beneficiary of over $35 million from the Volkswagen (VW) Environmental Mitigation Trust, part of a settlement with VW for violations of the Clean Air Act. The Conversion to Alternative Fuel Grant Program allows businesses that convert vehicles to run on natural gas, propane, or electricity to apply for a grant of up to $2,500 to offset the cost of installation. Understanding the factors that influence the quality of our air is imperative to mitigating the harmful effects of poor air quality on public health. Hazardous air pollutants (HAPs) are air pollutants that are known to cause or suspected to cause serious, adverse health effects. They come from a wide variety of industrial, residential, and mobile sources. (01/25/16)—This website provides information on DAQ’s Clean Power Plan stakeholder process.